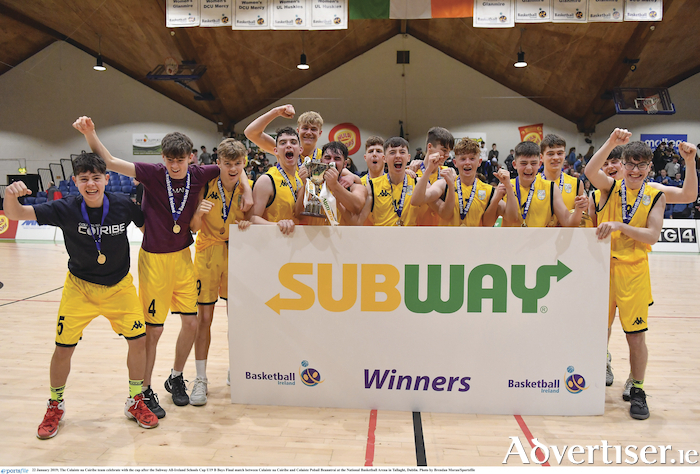 Colaiste na Coiribe of Galway bagged the second national cup title for the west of Ireland when winning the Subway Schools U19 B boys' final. In another thrilling schools decider at the National Basketball Arena in Tallaght, Colaiste na Coiribe won out in the end, 59-51. Bantry set the early pace with Liam Cotter getting them off the mark early, but three-point scoring from game MVP, Coiribe’s Cronan Ward and Máirtin Ó Conghaile closed the gap at the other end. Bantry continued to dominate at the boards, with Kevin Clifford adding some big three pointers, and with scores from Shane Murray, the Cork team had taken a 12-20 lead at the end of the first. However Colaiste na Coiribe came out of the traps all guns blazing in the second quarter. The Galway school responded to the big shooting from Bantry’s TJ Sullivan, Cotter and Murray with Ward again to the fore, while Cathal Madden, James MacLochlainn and Oisin Ó Gormaile added some big scores to tie the games level at half time, 27-27. A thrilling third quarter followed, with Colaiste na Coiribe edging into the lead after four minutes, and scores from Ó Gormaile, Ó Laighléis and James MacLochlainn saw them edge further in front. A massive three-pointer from Shane Murray for Bantry was the reply, and this was followed by another big three-pointer from the high-scoring Thomas Flynn. Momentum was firmly with Colaiste na Coiribe though, and they held the lead, 44-38 going into the last. A frantic fourth quarter had the crowd on the edge of their seats as scores were at a premium for both sides. Cathal Madden got Colaiste na Coiribe off the mark, and scores from Ward and Ó Gormaile followed. Bantry refused to go down without a fight, and superb three-point shooting once more from Flynn, Murray and Cotter closed the gap right back. However time ran out on the comeback, and Colaiste na Coiribe were crowned champions by eight points. COLAISTE NA COIRIBE (GALWAY ): Cathal Madden (6 ), James MacLochlainn (12 ), Tom Ó Mathúna, Cronan Ward (19 ), Oisin Ó Gormaile (18 ), Ross Ó Nualláin, Cian Ó hIarnáin, Oisín Turley, Eoin Ó Domhnaill, Conor Ó Bruada, Nicky Ó Laighléis (1 ), Máirtin Ó Conghaile (3 ).